Vietnam and Cambodia are ideal destinations for families desirous of experiencing the true essence of Southeast Asia. 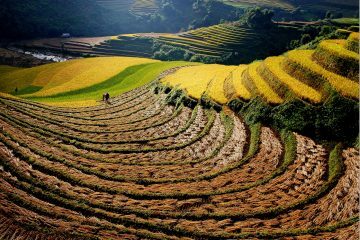 This tour begins with highlights of Vietnam, plus an assorted mix of relaxed cycling, kayaking and cooking classes. 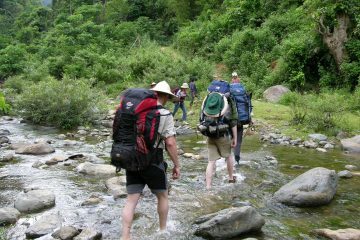 Begin with two nights in Hanoi where you will visit the major city sites and the fascinating Old Quarter. Attend an evening performance at the Thang Long Water Puppet Theater. The next stop on your trip is a day trip to Halong Bay. This area boasts a spectacular natural environment with more than 3,000 tiny islands. You will have the option to swim or kayak in the beautiful clear waters. 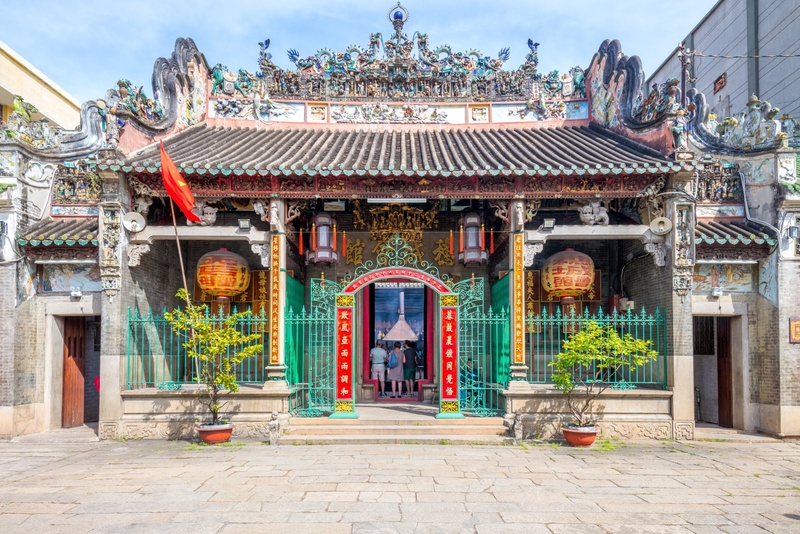 Next journey on to Hue where you will travel by dragon boat along the Perfume River to beautiful pagodas and royal tombs. The following day, drive along the mountainous coast to Danang. 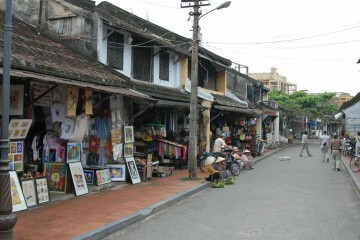 From here, visit the nearby town of Hoi An, where you will visit a local school and speak to the students. You will then journey to HCMC (former Saigon) for a walking tour of the city’s most famous and historic landmarks. Also visit the Cu Chi Tunnels. 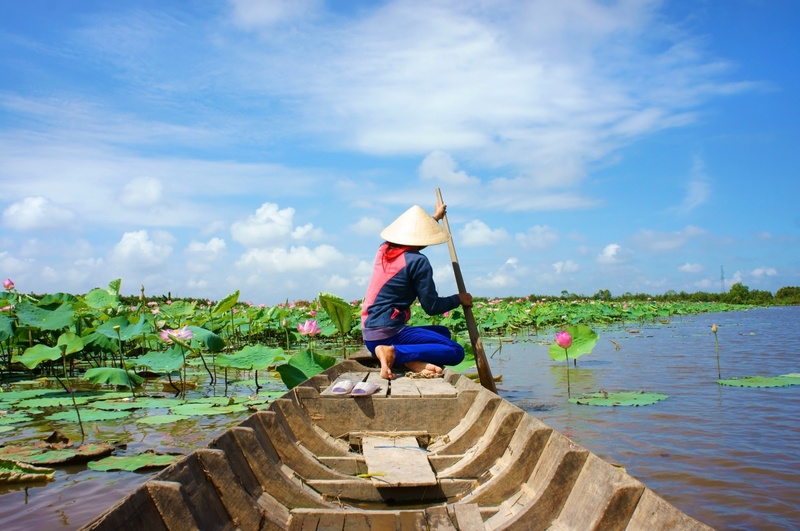 Continue to the Mekong Delta, the heartland of Vietnam, where you will sample local fruit and produce and ride a small sampan along narrow canals. 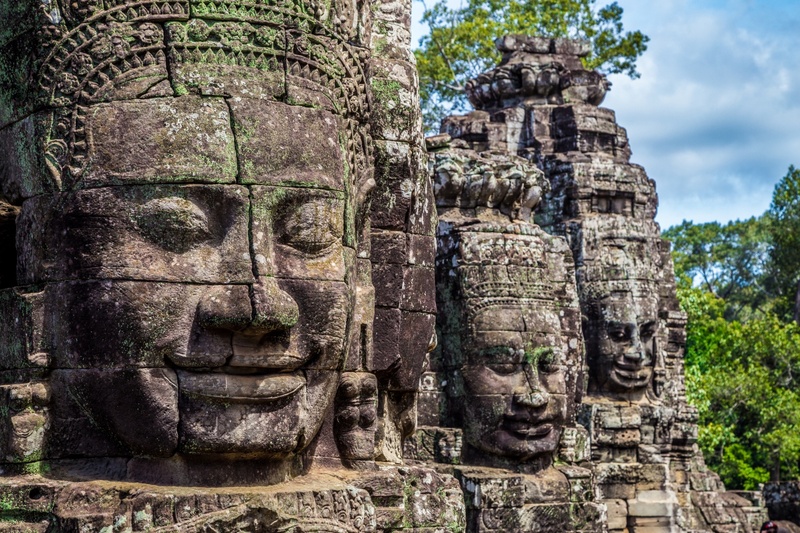 Next, fly to Cambodia ‘s wondrous Siem Reap, home to the ancient jungle-covered temples of Angkor. 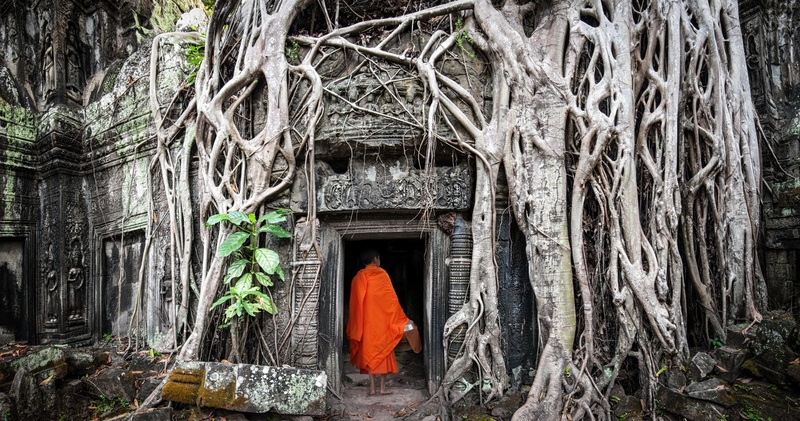 This temple complex was once the center of the great Khmer empire and now exists side by side with the mighty jungle. The sites of Angkor offer endless surprises and incredible natural cohabitation between man-made structures and the natural setting. Spend three nights here exploring the area by foot, car, and elephant. Arrive this morning in Hanoi, Vietnam 1,000 year old capital. Historical emphasis on the arts and learning stipulates that buildings in Hanoi remain small, simple and in harmony with nature. You are met at the airport and escorted to your hotel. Afternoon is at leisure. Evening enjoy a welcome dinner at local restaurant. Overnight in Hanoi. 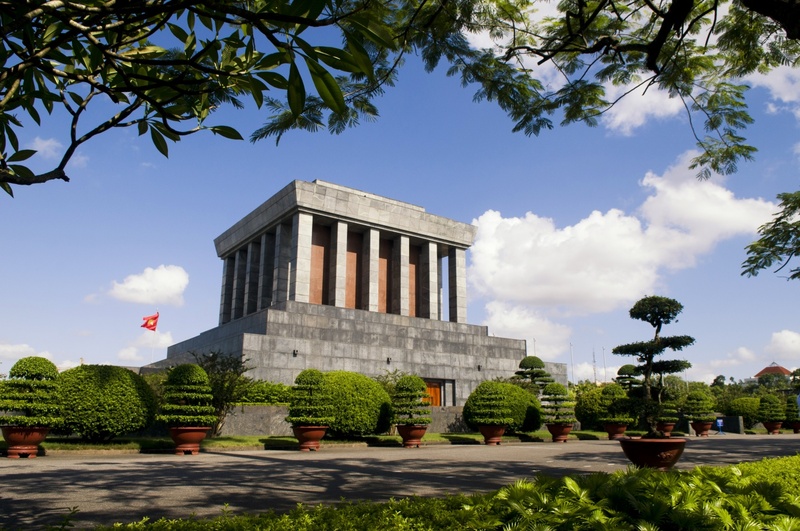 Visit the Ho Chi Minh Mausoleum, where the preserved body of “Uncle Ho” may be viewed, his nearby house, the lotus-shaped One Pillar Pagoda, Quan Thanh Temple, the Temple of Literature, Hoan Kiem Lake, Ngoc Son Temple, and a couple of museums. Following lunch at local restaurant,you will enjoy a cyclo ride around the Old Quarter. Evening there will be a traditional Vietnamese water puppet show. Overnight in Hanoi . Upon meeting you at your hotel at 8:00 am, you drive to Halong City , approximately 3.5 hours away. Once at Halong City you will board our private boat for a four-hour cruise of this stunning area, stopping along the way to visit one of the limestone caves in the area. As you are cruising, your boat staff will serve a sumptuous local seafood lunct. After 4 hours, you cruise back to the harbor and return you to your hotel in Hanoi. Free. At leisure. Overnight in Hanoi. In the morning you will take a flight to Hue. Upon arrival in Hue you are warmly welcome and transfer directly to hotel. At leisure. 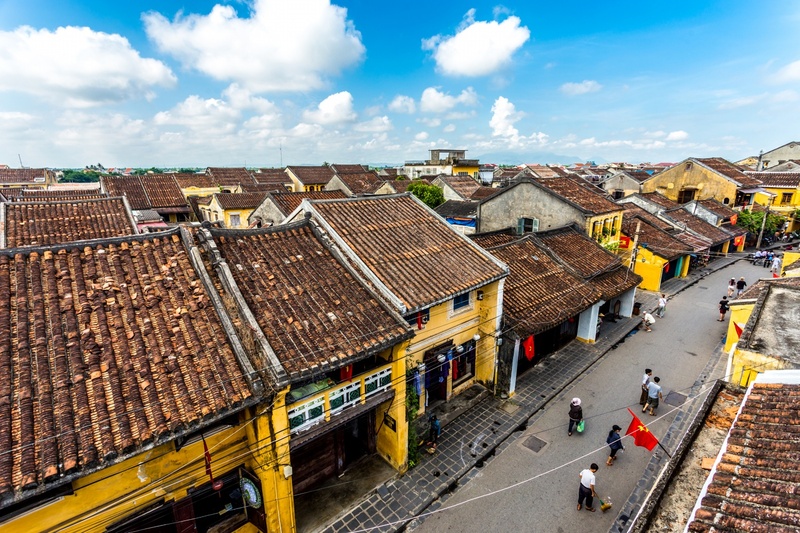 This afternoon you embark on a tour of Hue City including the Citadel, the Forbidden Purple City, the Imperial Museum and the Dong Ba market. Overnight in Hue . Rising up in the ancient land, breakfast in hotel, we board on a private boat for cruising on the romantic Perfume River. This time you head out for the countryside. Being the ancient capital, Hue is surrounded with ancient tombs of emperors past, and a visit to some of these tombs will be on the itinerary for today. 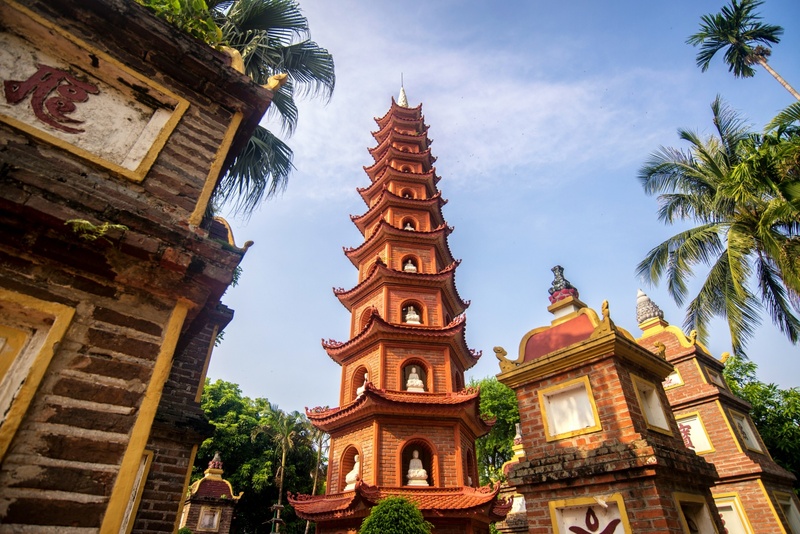 The charming Lady Pagoda (Thien Mu Pagoda) will be the first stop of the day. Setting in the converge of rivers, and gives you a great view on the Perfume River and surrounding area. From here you will cruise further to the ornate Minh Mang’s tomb. After enjoy lunch at local restaurant you continue drive to visit king Tu Duc’s tomb and king Khai Dinh’s tomb. Overnight in Hue. Leave Hoian we make the 60 minute drive from Hoi An to Danang Airport . From Danang we take the one-hour flight to Ho Chi Minh City , where we transfer directly to our centrally located hotel. 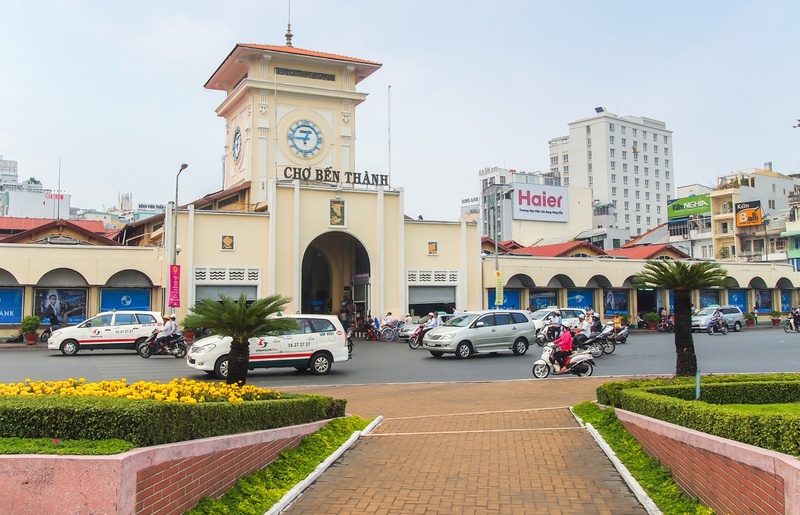 We embark on a city tour of Saigon including The Reunification Palace, Notre Dame Cathedral and Old Post Office, Remnant War Museum , Giac Lam Pagoda, China town with ancient pagodas and temples, and bustling Binh Tay Market. Overnight in HCMC. In the morning visit to the Cu Chi Tunnels. At its height, the tunnel system stretched over 250km. from Saigon to the Cambodian border and was three levels deep. The network included innumerable trap doors, specially constructed living areas, storage facilities, weapons factories, field hospitals, command centers and kitchens. Today the remaining tunnels have become a major tourist attraction giving the visitor a unique experience and a feel of what underground life during the U.S.-Vietnam War must have been like. Afternoon city touring HCMC, the country’s commercial center and home to a growing number of upscale restaurants and shops. Visit Chinatown, the Thien Hau Pagoda, the Reunification Palace , the Opera House and Hotel de Ville. If desired, also visit the moving War Remnants Museum . Explore colorful outdoor markets and Dong Khoi Street , the city’s upscale shopping boulevard with boutiques selling clothes and accessories designed by new Vietnamese designers, hill tribe crafts, high quality linens and housewares. Try the south’s strong Vietnamese iced coffee and a banh mi (baguette sandwich). Overnight in HCMC. In the morning you leave Saigon to lush My Tho where you take a private boat to through the green vegetation of the canals to an orchard, where we are treated to a delicious lunch in bonsai garden in the heart of Mekong , complete with tropical fruits. You also visit the snake farm Dong Tam that breeds snakes for, among other things, snake wine and enjoy a bonsai garden before heading back to HCMC. Overnight in HCMC. You have free time until transfer to airport for flight to Siem Riep, your base for visiting the fabulous ancient sites of Angkor, one of the wonders of world. The grandeur of this bygone civilization is truly astounding. Warmly welcome at Siem Reap International airport, you are met and transfer to your comfortable hotel. Free. Atleisure. Overnight in Siem Reap. Today you visit the antique capital of Angkor Thom (12 century), the South Gate with its huge statues depicting the churning of the ocean of the Bayon Temple, unique for its 54 towers decorated with over 200 smiling faces of Avolokitesvara, the Phimeanakas, the Royal Enclosure, the Elephants Terrace and the Terrace of the Leper King. In the afternoon visit Angkor Wat – the most famous of all the temples on the plain of Angkor. The temple complex covers 81 hectares, which is considered by art historians to be the prime example of classical Khmer art and architecture.Then continue to view wonderful sunset from Phnom Bakheng Hills. Dinner and enjoy watching Khmer Folk of charming Apsara dance show at local restaurant. Overnight in Siem Reap. Afternoon visit the unique interior brick sculptures of Prasat Kravan, Srah Srang (“The Royal Baths” was once used for ritual bathing), Banteay Kdei (surrounded by 4 concentric walls), Ta Keo, constructed in late 10th early 11th century C.E and Ta Prohm, one of the area’s most beautiful. Overnight in Siem Reap. Free. At leisre or you may board on boat in Tonle Sap Lake, the “Great Lake” of Cambodia, one of the largest in Asia. Here, enjoy a brief cruise past floating villages complete with schools, restaurants, and hospitals until transfer to Siem Reap Airport for departure. End of tour.